Another week means four more players that fans of the Vegas Golden Knights should be keeping an eye on. Two weeks into this 30 team project, I confess, I was concerned that we had birthed a THW curse. On January 3rd, we told you that Anaheim Ducks forward Jakob Silfverberg was likely headed to Vegas this summer. The 26-year-old Swede was putting together a career year before he was sidelined with an upper-body injury last week. He’s missed the last two games for Anaheim. Two weeks ago, we shined the spotlight on Colin Miller as the prospective Vegas pick from Boston. A day later it was a lower body injury that felled the Bruins blueliner, and his missed-game streak has reached six, with no timeline for his return. Prepared to stamp these lists with the dreaded curse label last week we finally got some good news in Buffalo. While compiling the four Sabres that Vegas fans should be watching, Ennis returned to the ice in grand fashion. As impressive as scoring 19 seconds into a game is, shortly after he tried to upstage himself. So fear not, Calgary faithful. Inclusion on this list doesn’t necessarily mean that dark times are ahead for these four players. Start your goodbyes, because the Flames have a difficult decision to make, and the name thatVegas calls is going to sting. There are also red flags. With Ferland’s multiple off-ice issues, it’s fair to wonder if Las Vegas would be a good fit for the 24-year-old. His legal issues and struggle with alcoholism are well documented. However, so too is his commitment to sobriety. A call from Vegas would mean a reunion with Golden Knights’ assistant general manager Kelly McCrimmon. Ferland played for McCrimmon’s Brandon Wheat Kings squad of the WHL between 2009 and 2013. He’s got plenty of upside and is unafraid to drop the gloves, an attribute Vegas GM George McPhee is sure to like. If he’s made available to Vegas in June, Chiasson may be the safer play for the Golden Knights. The likelihood of the Flames leaving the forward unprotected, however, is fading by the day. Recent losses have resulted in a shakeup of the lines in Calgary. What was once thought to be a top-heavy group of forwards has given way to uncertainty as to who will be left exposed to the expansion draft. You could make the argument that Chiasson is of similar value as Kris Versteeg and Troy Brouwer. You wouldn’t be wrong. Mileage is the tipping point here. Both Versteeg and Brouwer have more than 300 NHL games on the tires over Chiasson. Additionally, Brouwer comes with a $4.5 million price tag, money perhaps best spent elsewhere. 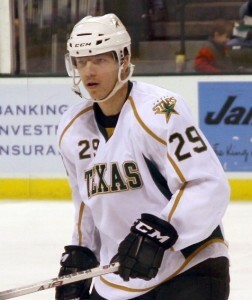 Just three years ago Chiasson scored 35 points in his rookie season in Dallas. That’s the version of the 6-foot-4, 208 pound right wing Vegas would like to get. Since that rookie campaign, he’s regressed, first in Ottawa and now in Calgary. If the Golden Knights can add 2014 Alex Chiasson to their roster, they may have something special. For the Vegas fan that thinks Chiasson is too grizzled a veteran to join the Golden Knights in their infancy, there’s former first-round pick Hunter Shinkaruk. There’s plenty of promise here. In 2013, THW’s “The Next Ones” profile stated, “What Hunter Shinkaruk has cannot be taught.” There have been flashes in Medicine Hat and Utica that have shown that statement to be true. 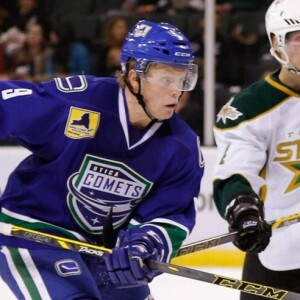 In the NHL however, Shinkarunk’s legacy is being traded by the Canucks for Markus Granlund in February of last year. That’s not to say the 22-year-old wouldn’t be a fantastic get for Vegas. Shinkaruk put seven games with Calgary under his belt before he was assigned to the Stockton Heat last month. In 20 games since returning to the AHL, he’s tallied 17 points and last weekend he racked up four assists in a game, a franchise record. 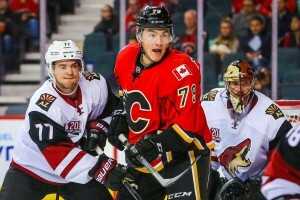 If Calgary decides waiting for that talent to translate to the NHL level isn’t worth the time, Shinkaruk may very be a project McPhee is interested in taking on. A healthy scratch 14 times this season and a third string blueliner may not sound too exciting for Golden Knights’ fans but watch closely. Jokipakka may flourish with a fresh start in Las Vegas. It’s hard to figure out where this guy fits in. Inconsistent play means inconsistent time. Jokipakka has often been passed over in favor of younger defenders, and as Ryan Pike writes, his inability to find a rhythm or become engaged in the game likely means his time in Calgary will soon come to a close. That doesn’t mean that Vegas bites, but it’s looking more and more like he’ll be available. The smart money says that T.J. Brodie, Mark Giordano and Dougie Hamilton are protected. Safe bets for sure, despite Calgary’s recent struggles. Jokipakka is only 25 years old. Depending on the other moves Vegas makes, it could mean a fresh start for a defenseman short on offensive prowess, but with the physical tools to be an intimidating presence on the Golden Knights’ blueline.